In small bowl, combine apple jelly, lemon juice and pumpkin spice; blend well. 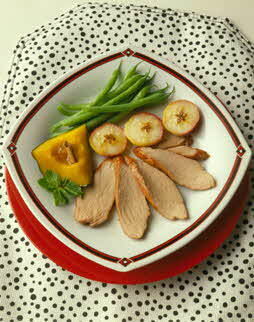 Place pork tenderloin in shallow roasting pan, brush with half of the apple jelly mixture. Roast for 20-30 minutes or until meat thermometer registers 155 degrees F. Let stand 5-10 minutes. Place apple slices on broiler pan; brush with remaining apple jelly mixture. Broil 5-6 inches from heat for about 5 minutes or until apples slices are tender. Slice tenderloin; serve with apple slices. This simple roasted tenderloin is perfect for a quick autumn weeknight meal. Serve with steamed Brussels sprouts and warm dinner rolls.